Samsung announced its new flagship device during this year’s Mobile World Congress (MWC) in Barcelona and will act as a direct replacement to the current fourth-generation model of the S series family of smartphones. 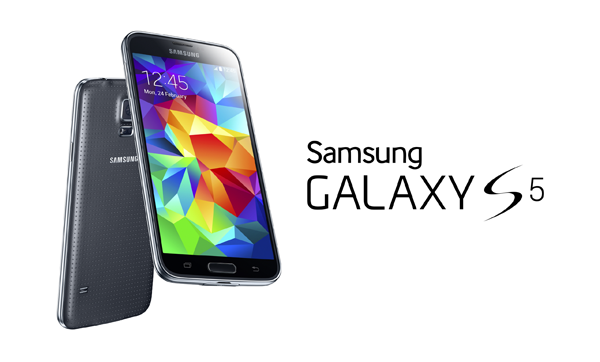 Consumers looking to get in on the Galaxy S5 action early on will be pleased to know that a number of UK and European based online retailers have put up pre-order pages for the hardware, revealing the price of Samsung’s latest gadget in the process. UK-based Clove Technology, which is a large online supplier of smartphones, tablets and storage peripherals, was the first company to set up a pre-order page for the Galaxy S5. The dedicated page has Samsung’s Android powered flagship available to pre-order immediately, with the first available stock expected to arrive on April 11th. 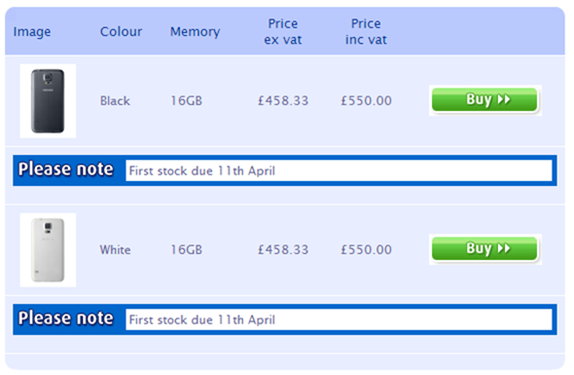 Clove has the smartphone listed for sale at a price of £550 GBP, inclusive of all local sales tax. At current exchange rates that equates to approximately $920 USD for the 16GB variant of the device. At the time of writing Clove didn’t have the 32GB option available. 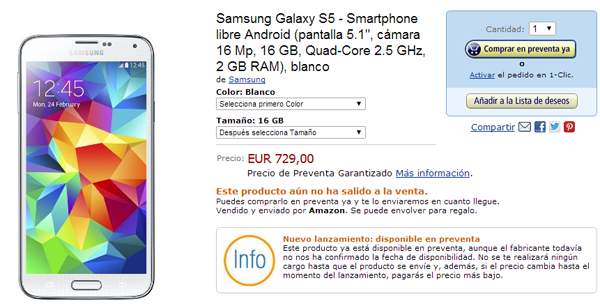 The Spanish arm of retail giant Amazon has also listed the entry-level Galaxy S5 as available for pre-order. Spanish technology enthusiasts can be amongst the first to get in on the action by parting with €729, equivalent to approximately $1005 USD, which is insanely a lot for a new flagship device. We’ve seen in the past that pricing in individual territories doesn’t automatically map out across different countries, but these early pricing points do seem to contradict rumors that Samsung was planning on pricing the latest model lower than the Galaxy S4. If recent speculation surrounding Samsung’s Galaxy S5 roadmap is anything to go by then it could be worth holding off on that purchase until later in the year. It’s heavily speculated that executives from the South Korean company held a behind-closed-doors meeting immediately after the MWC unveiling to discuss a luxury F line model of the device, which is considered the premium Galaxy S5 variant, reportedly set to launch in May. Still, for those who need it as soon as it’s launched, this information should provide a little more insight into timescales and approximate pricing.